Blistered Paperbark, South Australian Swamp Paperbark, Kangaroo Island Paperbark. Indigenous to Western Australia, South Australia and Victoria. 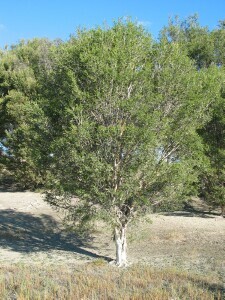 Shrub or tree, 2–7 m high with white and papery, often peeling, bark. 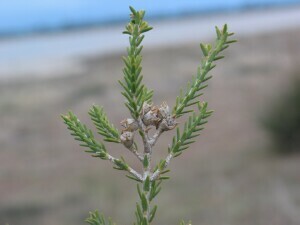 Leaves opposite, each pair at right angles to the preceding pair, lanceolate, 3–8 mm long, 1–2 mm wide, thick, flat on top, curved below. Flowering in spring to early summer with flowers white, few to many, crowded into spikes at the ends of the branches. Each flower with 8–12 stamens much longer than the 5 minute petals. Fruit an ovoid capsule, 4–5 mm diameter, borne singly or a few together on the old wood. Usually grows in low lying areas with saline soils and around salt lakes. Mature trees can withstand waterlogging. 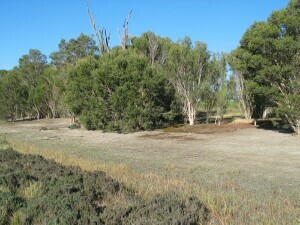 More common in the north-west of Victoria but occasionally found further south.